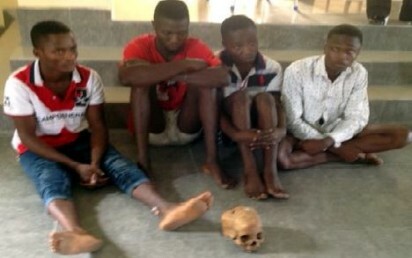 UYO—Luck ran out of four young men said to be trading in human parts as they were, yesterday, arrested by operatives of Criminal Investigation Department, CID, of Akwa Ibom State Police Command, when the suspects went looking for a buyer of a human skull in their possession. The suspects and their ‘cargo’. The suspects are Emmanuel Edet Ikot, 17, from Edeabasi, Oron; Ubong Udong, 18; Bright Effiong Okon, 19 and Okon Ita, 20, from Orukim. The alleged leader of the group, Emmanuel Edet, denied the accusation, saying he only stumbled on a human skull while working at an uncompleted building for a man (names withheld) in Oron. The Akwa Ibom State Police Public Relations Officer, Delia Nwawe, who spoke on behalf of the Commissioner, Mr. Murtala Mani, said the suspects were arrested by officers of the CID of the command in Mbo Local Government Area on receiving an alert from vigilant youths in the area. He said with the arrests effected, the suspects would be charged to court for the law to take its course. Speaking with Vanguard, leader of the gang, Mr. Emmanuel Edet, said: “I was paid to cut grass and clean up an uncompleted building by one man in Oron. “As I was clearing the place, I stumbled on a human skull. I then rushed to inform my friends of what I found and in the company of those my friends, we went to pick the human skull. “After picking it, we decided to sell it, but we did not know of any possible buyer. So, it was suggested by one of us that we take it to a native doctor in Mbo. The four of us went together but on our way, we were held by the youth leader of Mbo.